We know that you have put an enormous amount of trust in us as we care for your children. We take this responsibility extremely serious. Each child/youth volunteer has gone through an application process which includes a criminal background check to ensure the safety of your children. We have a secured check in procedure for children ages 0-Kindergarten. When your child is checked in, they will be assigned a number and you will be given a tag with the same number. When coming to pick up your child you will need to present the tag so we can correctly identify your child. If you happen to lose your ticket, you will need to present a photo I.D. so we can ensure the utmost safety for the kids. The number you have been assigned will also be our means of "paging" you during the service if we need to get in touch with you to care for your child. We will post your child's number on the screen in the worship service if we need to get in touch with you. Please come downstairs to the check in area if you see your child's number. Childcare is available downstairs for infants to children up through age 3. 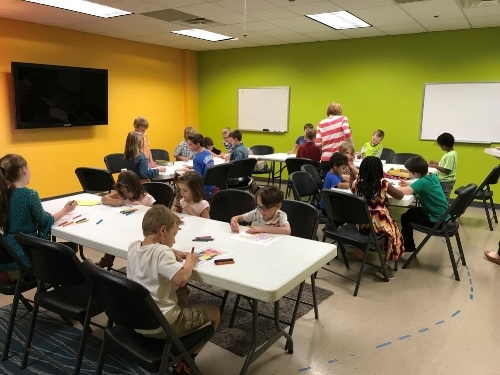 Grow Zone is a safe and energetic environment for children that allows them to increase their knowledge of the Bible and how to apply it to life. During the 9:00 a.m. service, children will start out with their parents in the Worship Service but will be dismissed part way through the service to go downstairs for Grow Zone. Following the service, parents should go downstairs to pick up their children. This program is for children ages 4 yrs.-5th grade. Children will start out with their parents in the Worship Service but will be dismissed part way through the service to have a Bible story relevant to their age, worship time, bible memorization and more! Ages 4-5 will have a Bible story, play time, crafts and a snack.